Daily Pulse, rhythm of the Tao – is a morning ritual, a beautiful positive way to start your day. Starting each day with deliberate choices creates calm in life. A daily ritual is a regular habit that provides rhythm and peace to everyday. 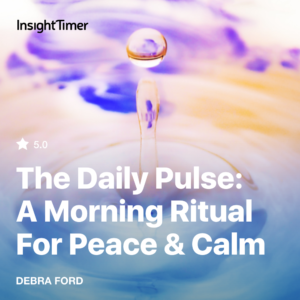 Daily Pulse is a morning ritual that helps you navigate life’s challenges and is part of a journey of deep self-awareness that gently and naturally leads to happiness. Daily Pulse morning ritual is built on the teachings of the Tao (pronounced Dow). The Tao is the heartbeat of nature, the essential rhythm of nature, the fundamental pulse of our world. This course ‘The Tao and SoleIntending’ is a profoundly simple concept that connects the fundamental teachings of the Tao to a balanced intending and goal setting process to create your life. In this course you will learn a simple, practical SoleIntending process that will help you create a happier life; a simple guided way for writing goals using the creative energy of the Tao. It’s always a good time to write intentions, but particularly at the beginning of each new year, at the new moon, on your birthday or during major life challenges. Once your intentions are written, then it’s time to release them into the universe, to hand them over to your God, your angels, your guides. To find a place of calm within yourself where you trust that what you are asking for will be delivered to you in the perfect way and at the perfect time. Here at the SolePath Institute, we are in the happiness business. We teach tools for living a happier life; practical, easy to apply techniques for being happier. This course ‘the Tao and SoleIntending’ is the genesis, the beginning of creating the happy life that you desire. At the SolePath Institute, our work is helping people to feel happier. We believe that happiness is achievable for each of us; we understand that finding happiness is a journey, and we know that although life is complicated – life is supposed to be fun! This course is for you if you are feeling unhappy and want to be happy. Perhaps you are dealing with change in your life, any change – an unwanted change in your love life, and an unexpected change in your career. Or if you are feeling lost and are not sure what to do with your life. This course ‘Creating happiness in your life with SoleNumbers’ helps you know what is causing your pain; it provides guidance and direction for your happiness; it gives you a deeper self-awareness and provides direction for choosing happiness. In my work as a counselor and a teacher, I have learned that the start to creating personal happiness is always deeper self-awareness; a deeper knowledge of what collapses you and what expands you; what makes you dark and what makes you light. Accepting that your happiness is not dependent on other people, that you are indeed ‘the boss of you’. The secret to being happy is knowing that you have the power to choose, understanding that happiness is a conscious and deliberate choice. In this course you find answers from your SoleNumbers, using the original energy of the Tao. You calculate and interpret the guiding number energy in your life – your governing SoleNumber. You calculate and interpret the number energy that is dominant for you each year – your next best step number. This art and science of understanding numbers is not based on conventional numerology, but rather on the ancient teachings of the Tao. We call it ‘The Tao and SoleNumbers’. Each number has an energy that relates back to the fundamental buildings blocks of creation. Each number has primal characteristics that hold secrets to your happiness. Each number is connected to the energy of the Tao. In this course, get ready to calculate your numbers and understand how to interpret them. At the end of this course, you will be able to calculate SoleNumbers for your friends and family too. That’s fun! And most importantly, this course and all of our work at the SolePath Institute is not theoretical or an academic exercise, it’s about practical application in your life so that you can be happier. Happiness is not outside of you, it’s within you – let me take you on a journey of self-awareness using the energy of your own personal and unique numbers.